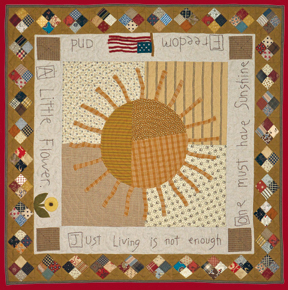 Finished size - 31" x 31"
Brighten up your world with this cheerful wall hanging or table topper. This fun project combines a little bit of several quilting techniques; piecing, cotton applique, wool applique and embroidery. It's also a great project to use up those favorite scraps you probably have saved for "just the right thing".